“Imagine for a moment you’ve just landed in a helicopter out on the tundra and you’re about a hundred miles from anywhere. And it’s costing you a dollar a second to be here,” Shumaker said. We pictured ourselves on the remote North Slope, near Alaska’s biggest oil fields. There, every winter, companies build hundreds of miles of ice roads — roads literally made of ice and snow — essential for moving the massive equipment used for oil exploration. But environmental regulations don’t allow oil companies to build ice roads until the fragile tundra is sufficiently frozen. And scientists say freeze-up is happening up to two months later than it did in the 1980s. That’s where Shumaker’s startup, called Beaded Stream, comes in. 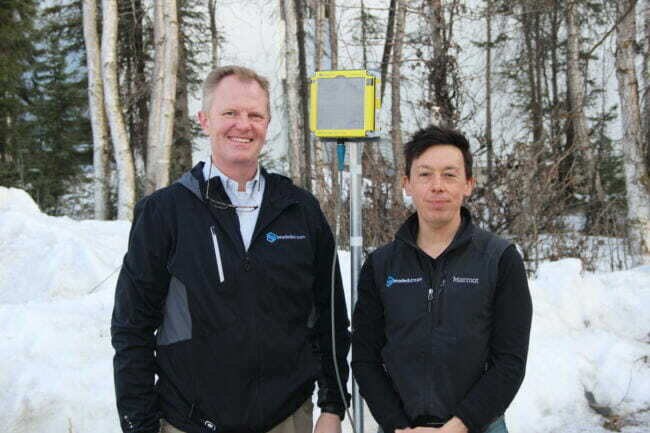 Shumaker has developed technology that monitors when the ground freezes, pinpointing exactly when ice road season can begin. To show how, Shumaker drilled into the frozen soil and inserted a blue and yellow temperature monitoring cable. He hooked it up to a small, solar-paneled box installed on a nearby pole — a data logger that sends temperature readings to the internet via satellite. 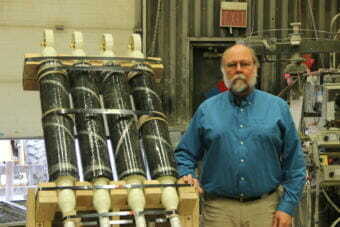 Using this device, companies can squeeze the longest possible oil exploration season into steadily shrinking winters. According to state regulators, Shumaker’s technology has actually helped lengthen ice road seasons in recent years. Beaded Stream isn’t alone. Alaska’s oil industry has specially designed its operations for freezing conditions. But as temperatures rise, companies are starting to pay a price for climate change — and some Alaska businesses are making money off of it. Oil companies now help support a cottage industry of consultants and product manufacturers, all providing workarounds for the fact that the frozen ground they rely on to produce oil isn’t as frozen as it once was. Although Shumaker said when he talks to customers, he doesn’t bother discussing why temperatures are rising. For an industry that’s often blamed for climate change, talking about coping with it is an awkward topic. Multiple oil companies contacted for this story turned down interview requests. But climate change is so present in Alaska today that the industry’s top lobbying group acknowledges it’s creating problems. 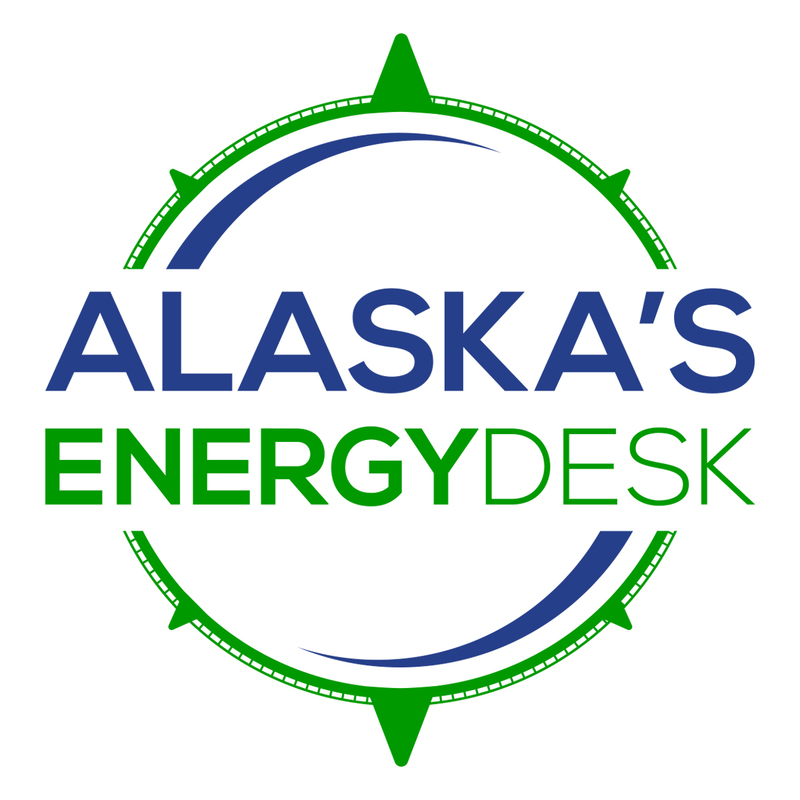 Josh Kindred with the Alaska Oil and Gas Association said there’s a lot of concern about shrinking ice road season. He also noted the industry is having more frequent run-ins with polar bears due to declining sea ice. “It is ironic, and it’s challenging for a state that is so dependent on resource extraction but is also really feeling the impacts of climate change,” Kindred said. But for Kindred and many other Alaskans, the idea of stopping the state’s oil production to address climate change is unthinkable. “It’ll be interesting to see how we navigate this…I don’t want to call it a conundrum, because I do think there’s an opportunity for success here, but what is our role and how do we do it? Those are very difficult questions,” Kindred said. Meanwhile, oil companies keep finding ways to adapt. Ed Yarmak runs a company called Arctic Foundations, which makes devices that literally refrigerate the ground. They’re used across Alaska — for roads, water tanks and schools. But Yarmak says now, about half his business comes from oil companies on the North Slope. Arctic Foundations was founded in the 1970s — the oil industry has always had to incorporate special engineering to work around permafrost, because infrastructure alone can cause it to warp and thaw. But Yarmak said rising temperatures mean his product is really starting to come in handy. On the North Slope, oil companies have built a vast network of roads, pipelines and buildings on top of permafrost. But permafrost temperatures in the Arctic have been rising for decades. Yarmak said for buildings on the North Slope, thawing ground can start to cause problems. “The doors start to stick. The sheet rock cracks…the floor isn’t level any more. Things aren’t the way that they planned them,” Yarmak said. Arctic Foundations’ products help protect against these issues. In the company’s Anchorage warehouse, employees in protective glasses manufacture thermosyphons, long metal tubes filled with a refrigerant. When finished, thermosyphons are partially buried in permafrost to keep it frozen. “This part is the condenser…it’s where the heat comes out and goes to the air,” Yarmak explained. Yarmak said each is custom made, and the ones for use on the North Slope and can cost roughly $10,000. He said oil companies have installed thousands of them across Alaska’s Arctic. And if the state continues to warm as projected, Yarmak expects to be in business a long time to come.